Over the month of October, Paulist Evangelization Ministries conducted an online survey about discipleship, a theme we have been exploring for over a year. 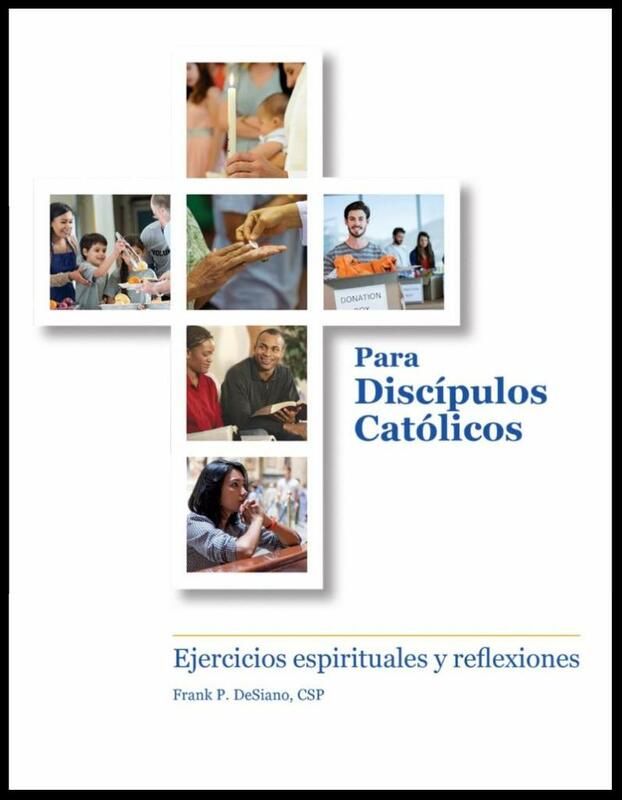 This was in connection with our new pastoral tool, Catholic Discipleship: Spiritual Exercises and Reflections; in Spanish, Para Discípulos católicos, ejercicios espirituales y reflexiones. This book aims at helping Catholics understand themselves as missionary disciples. The results were surprisingly encouraging. Almost everyone who took the survey considered herself or himself to be a disciple of Jesus. Some caveats. Our email list contains some of the most active Catholics in the United States. We did not provide a working definition of discipleship. And we had only 412 responses. So we cannot claim the Gallup Poll award for scientific accuracy. However, we were not out for pinpoint accuracy. We just wanted to see how active Catholics thought about themselves and others when it came to discipleship. 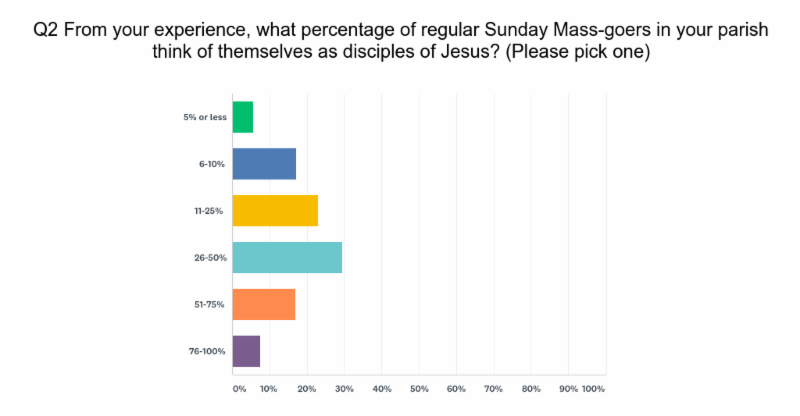 This survey response is a major hint that the image of being a disciple of Jesus is well embedded in the imagination of almost all Catholic pastoral ministers and pastorally active Catholics. Indeed, the highest self-identifying label of those who responded was “lay pastoral volunteer/minister”, followed by “religion teacher/catechist”, “parish leader”, and “adult faith formation director”. One obvious conclusion from this survey is: church leaders can build upon the image of disciple in order to deepen and expand the spiritual and pastoral understanding of those most active in the church. 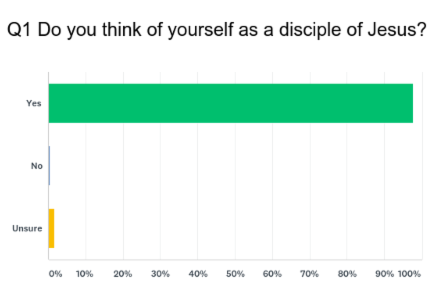 What percentage of your parishioners think of themselves as Disciples? This seems a more adventuresome question because it asks about discipleship—or the perception of discipleship—among a larger group of practicing Catholics. Quite surprising to us, the answers were amazingly generous. This is surprising because the prevailing default attitude is more likely to be that most Catholics don’t think of themselves as disciples, and that forming disciples is a rather failed project of the Catholic Church. That is, we can catechize some people, and sacramentalize some Catholics; but it’s hard to make them into disciples, let alone missionary disciples. Our respondents, mostly older and active Catholics in parish leadership and ministry, saw the “average Catholic in the pew” in rather positive terms when it comes to discipleship. Fifty-one percent of our respondents thought that anywhere from 10-50% of active parishioners saw themselves as disciples. Even more, 45% of respondents would point to 25-75% acceptance of discipleship in their experience. It could well be that active parishioners only see other active parishioners, or people tend to respond positively to surveys; but this impression gives further evidence of the growth of the idea of discipleship, not only among active ministers and volunteers, but among larger swaths of Catholic congregations. As a conclusion, one can say that our unscientific survey found a broad acceptance of discipleship not only among active ministers and volunteers, but in large sectors of the average Catholic parishioners. Helping Catholics see themselves as missionary disciples has to be a top agenda for all parish leaders. Our survey results give us reason for optimism, even in the face of increasing statistics about diminished participation in Church, particularly among the young. Our survey responses, however positive they are, only point in a direction. The notion of discipleship, and its meaning in Catholic life, has a good ways to go in the Catholic consciousness, particularly in its implication. Paulist Evangelization Ministries has just produced a pastoral tool to help Catholics reflect on discipleship and discover its dimensions in their ordinary Catholic life. Catholic Discipleship: Spiritual Exercises and Reflections is the perfect tool for any pastoral leader who wants to foster a consciousness of discipleship among parishioners. Its flexible use allows it to be used by individuals, small groups, and adult faith formation groups. Web resources are available here to help parishes implement it. También, este libro está disponible en Español: Para Católicos Discípulos, ejercícios espirituales y reflexiónes. Líderes parroquiales pueden usar este libro en various contextos (individuales, grupos pequeños, y grupos de formación para adultos) para extender el conocimiento de discipulado entre sus feligreses.